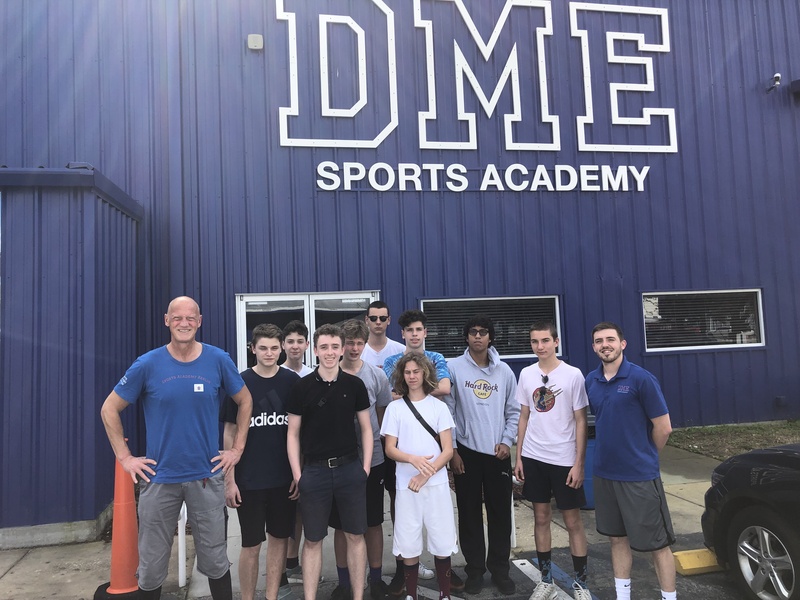 From February 19 to 27, our boys’ basketball team had the great opportunity to visit Miami, Florida, for a match with the DME sports academy at Daytona Beach. Ferdinand tells us about all the exciting things they experienced there. Thank you, Ferdinand and special thanks to Mr Wehrmeyer and Mr Johnson for organising the trip and making it a fantastic experience for the boys! The 10 boys from 8th till 11th grade basketball team as well as the assistant coach, Mr Johnson and head coach, Mr Wehrmeyer got the opportunity to visit Miami for a match with the DME sports academy at Daytona Beach. The trip took 7 days and was a great opportunity for many to learn new things about each other as well as the country and the culture there. On the first day, we arrived at the airport a little bit jet lagged and hungry. So, we went to the car rental service and got two Dodge vans and drove to the supermarket which turned out to be harder than we thought because we drove in the wrong direction and lost each other due to Mr. Johnson’s instinct for NASCAR racing on the streets of Miami. Later, after we found each other and went shopping we arrived at the house which we, the ten boys would share for the rest of the time in Miami. The next day we were all awake at around 5 am and glad that we had went to the supermarket the day before, so we could have proper breakfast. At around 6 the coaches picked us up, so we could go to the beach for some workout. Around 1 million kilometers of running through sand later we chilled and went swimming in the ocean for the rest of the day. Back home, we got the opportunity to try the pool and Jacuzzi which was absolutely amazing. The third day was the reason why we came to Miami, the basketball game at the DME academy. To get there we set to 4 hours’ drive which made the coach never drive again. As we reached the school, we were shown the high technology instruments for optimal training conditions. This included many basketball courts, fitness rooms and a regeneration center. We were invited to do a test to see how fit we were and I guess it should make us tired before the games started. When the test was complete, we went to Taco Bell which was new to allot of people, but they liked it. Suddenly it was game time and we took the lead and lost it a while after that. But the hope was not gone until we lost the game and were allowed to rethink the match 4 hours later in a mall, because Tim (one of the players) wanted to go to a chick-fil-a restaurant. Apparently, he was the only one not eating there after all. The next day we just wanted to chill so we made it a beach day with playing football and swimming. The Sunday was the most interesting day (in my opinion) because we went to see the campus of the University of Miami which was huge. Furthermore, we went to see a college game which was an absolute highlight due to the infinite re-fill popcorn and soda package, and the game of course. When some of the team’s players got on the camera which was displayed on the huge screens in the middle we completely freaked out. The next thing we did was go to Hooters, which is a restaurant with very strange conditions of working criteria. When we solved the absolute mess of paying. We got to see the Miami Heat play against the Detroit Pistons in the American Airlines Arena. The game passed by and we were allowed to go on the court to shoot free throws. Despite the other 100 thousand people all wanting to shoot as well and Coach Wehrmeyer’s airball it was a very memorable event. On Sunday it was Paul’s birthday, which was why we had a barbecue with extremely delicious cake and meat. The last day of our trip before we would fly back to Berlin was an opportunity to go shopping again. The basketball team split up because some people wanted to go to the huge outlet mall and some wanted to go to a small nearby mall. I do not know what the group in the big mall did, but the day for me and the other people with me who went to the small mall was very relaxing because we only bought shoes and clothing. Afterwards we went to Flamingo Park to play basketball until it was time to go home. What happened next was definitely the worst part because the other group was not there, yet we had to clean the house without them, which was extremely hard. The last day was very stressful because we had to catch our plane. Overall, I think everybody would have wanted to stay longer. Posted in Blogs, News, Rückerstrasse, Secondary, Sports, Top.